I have been a busy, busy girl lately! On top of being a wife, mother and domestic goddess (and oh yeah, pregnant!) I'm also a graphic designer. This summer has found me loaded with jobs. Baking has been pushed aside for more pressing chores like wedding invitations for excited brides. But the hormones haven't stopped making me crave baked goods so I've had to become stealthy in the kitchen. It's all about fast and easy these days... but also tasty! I bought a pineapple on sale with the idea that my girls would gobble up it's juicy goodness, but I was sadly mistaken. They did eat some, but at the rate they were going it would have been mush before they finished it. So I needed to use it and FAST. I would have eaten it as is but the heartburn would have killed me! 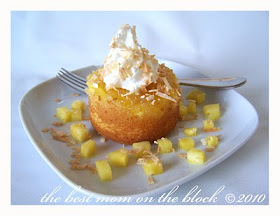 So I thought back to my childhood (ahhhh nostalgia) and remembered fondly my grandma's pineapple upside down cake. It was sweet and moist and so delish. I'm still craving coconut, and pineapple and coconut go so perfectly together. Just thinking about it made my mind wander to tropical drinks by the pool... wait, tropical drinks... coconut rum! Yes! A little rum in the cake, even when pregnant (because the little bit of alcohol would be negligible after baking and spread throughout an entire cake), would be awesome thought I. And I made it so. 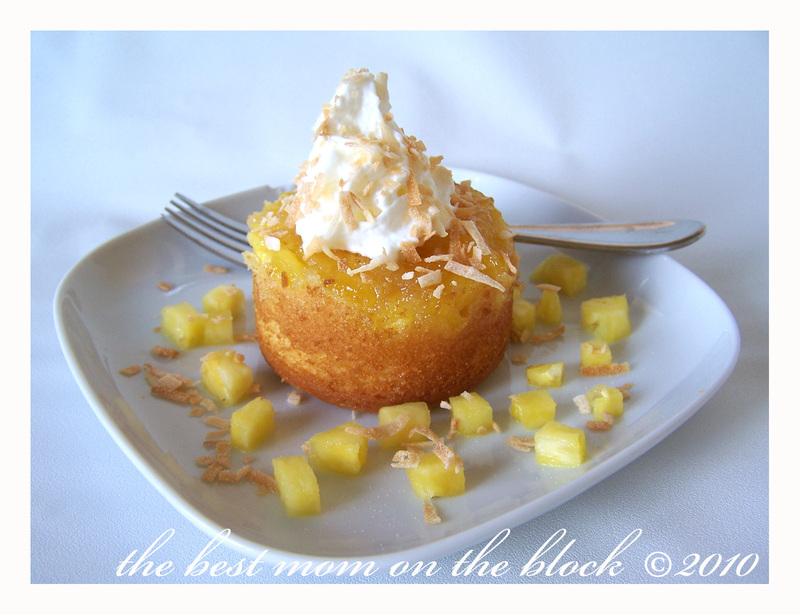 This cake is super easy and tastes like a vacation in your mouth! Using a boxed cake mix cuts wayyyy down on prep time so this cake is perfect for last minute BBQs or satisfying pregnant lady cravings! 1. Prepare your cake mix as per your brand's instructions substituting 1/4 c. of rum for 1/4 c. of the water. 2. Dot the butter around the bottom of a 8" x 8" pan and sprinkle with the brown sugar. 3. Spread the pineapple over the brown sugar & butter in an even layer. 4. Cover with the cake batter and bake at 350˚F for 30 minutes or until a toothpick inserted in the centre comes out clean. 5. Allow to cool for 10 minutes and then place a plate or platter over top the cake pan and invert to release the cake. 6. Sprinkle with the toasted coconut and serve with whipped cream or ice cream. Gorgeous pix. That first one is a scroll-stopper. I just had my 3rd 5 weeks ago and am happy that Baby Sister finally made her grand exit. There were plenty of cravings during those 9 months. Mostly chocolate ones. If you are having heartburn, did you know you can take Priolsec OTC when pregnant? It saved my life- and my burning heart. I take Zantac 75 when it's really bad. But it hasn't been horrible this time around... THANK God! It's finally setting after 55 minutes in the oven. I wonder if it's the difference in pans? 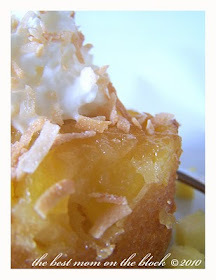 Regarding the Coconut Rum Pineapple Upside Down Cake. This recipe should call for 2 8x8 cake pans. Can't taste the coconut rum either.